Read the Globe’s interview with Margot Perlmutter on their website. My way of dealing with most issues in life is not to create sides, but to listen to both. This works whether it is a fight between two campers, or whether it is a misunderstanding with regard to a First Nations or LGBQT issue. That being said, there is no methodology in place at all by which to categorize any dispute. Nor should there be! Categorization is the worst enemy of disputes. This is well worth repeating. Nobody wants to be labeled. In fact, most disagreements become issues because someone feels undervalued, and sharply so. Through years of experience, I have learned several factors to be true in all disputes. Bearing these in mind during the time of an altercation can often serve as a way to bring it to closure well before expected and with better results. Additionally, if I consistently approach others with actions that support these factors, it is much less likely that the issue will occur. There is intrinsic value in every person. Everyone matters, and everyone has something good to offer a family, community, nation or world. I agree that not everything offered is good. I also agree that some things that are believed are not true. But the right to have beliefs and the right to choose – these are the freedoms that we all should be able to possess. They are of greater importance than any disagreement that can arise between me and another person. No two people agree on everything. This only means that it is actually possible to further create argument and divide until community is extinguished and self is all that is left. Tragic! If I listen, I will learn. So listen to their story, to their reasons for believing and valuing what they do. While I may not choose to adapt their belief structure into my own, at the very least I should learn something of what matters to them. Perhaps they want to lobby for a cause that completely misses what I have usually thought. Perhaps their reason is loyalty, or fairness, or something that I also value. If I shut them down because I disagree with the campaign in general, then they are hearing that I disagree with loyalty or fairness. We are amazing people. We are capable of going to the moon and back, of building space stations, and of inventing cures for diseases that used to obliterate whole communities. Why is it so difficult to believe that we all have something of value for which to give honour? Always ask questions before offering a defense. “Are we really in disagreement in this matter?” Even a question like that can create enough doubt that the other person will calm a bit. Follow it up with, “Could I please ask you to share your main concern again? And then, “Could you tell me what underlying values you hold onto that cause you to support this concern? Never consider your own response at all while listening. Listening is for learning, hearing and understanding. Always create space for accepting a different view, while maintaining the value for the person. The way we talk must also model that this space is available. Bears attack when their escape is cut off. If people have the right to choose, then let them choose. What you feel defines your concerns, not theirs. Sharp feelings such as jealousy, rage, fear or hatred are signs that we have unresolved issues in ourselves. So the next time that feeling arises, it should be another opportunity – not to set someone else straight – but to resolve what we haven’t in ourselves. If it came out of someone’s criticism, or exaggerated disparagement, then quietly ask yourself what part is true, and begin to change that part. concern. Follow that up with actions that support it. What this really amounts to in the face of the heat is that we must relax our grip and show love. Finally, when mediating, reset the focus with questions. It’s very difficult to get someone else to show appreciation for the other person’s view. So if two boys are brought into my office after a fight, getting them to tell their side of the story will become a never ending nightmare of trying to prove the other person to be wrong. Now deep inside they both know that they could have done something differently… that at some point they made a choice to fight back. Rather than focus on the part that creates division, focus on the part inside each of them that they would rather not admit. The question I often use is, “So tell me what you could have done differently?” or “What did you do that you know you should not have done?” I always begin with the one that I think is more likely to spill first. When he starts with, “Well he…” I stop him and say, “No, what did you do that was wrong? He will have his turn to tell me what he did wrong.” The first admission almost always encourages the second. And by the time the second is done, the boys will often ask each other for forgiveness before I even get that far, and then they leave as friends. If we embrace our differences, we actually, at the same time, are embracing our similarities. Sterling Talent Solutions offers complimentary webinars. Engaging Volunteers for Impact and Success. Tuesday June 15, 2017 2:00 p.m.
All past webinars are archived and can be accessed at any time. Should you have questions about any of Sterling Talent Solutions services or require assistance, please contact CCA’s account representative Linda Ferens at linda.ferems@sterlingts.com. All foreign workers who wish to secure a temporary work permit as a camp counsellor should be processed under this recently created category. Minister Ahmed D. Hussen and previous Minister John McCallum, MP Michael Levitt, MP Anthony Rota, Roland Parris – previous Senior Policy Advisor to Prime Minister Justin Trudeau, MP Marco Mendicino, MP David Graham, MP Anthony Housefather, MP Jamie Schmale, MP Ralph Goodale, MP Rodger Cuzner and Minister Patty Hajdu. A heartfelt thank you goes out to Mark Diamond and Jonathan Nyquist who co-led this initiative, as well as the following members of our Association who dedicated a substantial amount of time on this matter: Barb Gray, Jonathan Pivnick, Adam Kronick, Sol Birenbaum, Leon Muszynski, Craig Perlmutter, Stephane Richard and Mike Sladden. We also appreciate the efforts of our very competent lobbying company, Tactix, for their exceptionally skillful guidance and support throughout this process. Take care and happy camping! What Are the Campers Saying? In the midst of all the work to open and prepare camp for the upcoming season, it is helpful; to remember the reason for all the effort− the campers! Spring is the season in a camp director’s calendar when suddenly the clock is ticking down. The time has come to open camp; assess the winter damage and schedule cleaning, repair and/or renovation of buildings. Back at the city office, there are still a few key staff positions and some camper spots to fill. Lists are created, suppliers have been consulted and the shopping and deliveries have begun. Another summer season is just around the corner. In the midst of all the administration and paper pushing, it is revitalizing to recall the reasons behind all the planning and preparations − the campers! 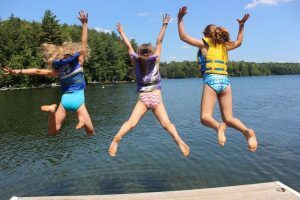 Recently I had the opportunity to read the 2016 reports from the hundreds of campers who were assisted in attending camp last summer by the Kids in Camp Charity. We all know how important camp is in the lives of children, but sometimes it helps to be reminded in the campers’ own words, why we do what we do. Thanks to Isabella, Randeonna, Mandy, Nika, Jude, Morgan, Angela, Taylor, Adam, Cameron, Samantha, Ethan, Logan, Hailey, Annabel, Kira, Parker and Desana for sharing their thoughts about camp. Thanks to all the camp staff across the country who will be providing amazing experiences for thousands more children in summer 2017.